The specialist Thermashield Ulti-Flex door is a specialist high speed sliding freezer door which opens at a rate of 2 metres per second. This helps to dramatically reduce temperature loss and ice build-up for high usage doorways in freezer stores. The doors also have a flexible and impact-resistant panel which reduces the ongoing cost of maintenance and repair. 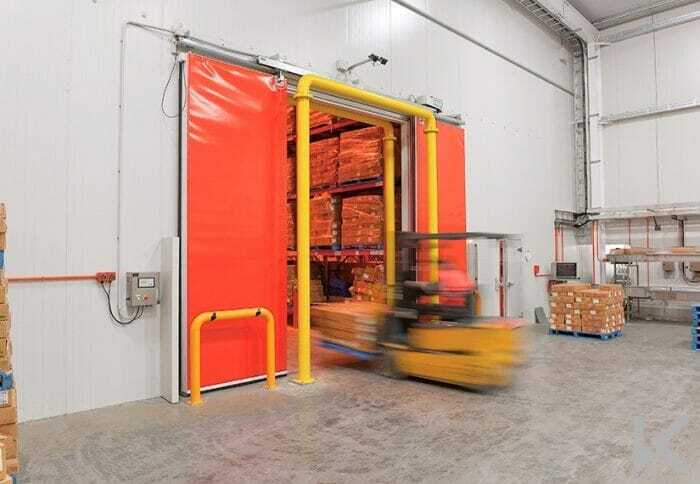 The doors are designed particularly for freezer stores operating a less than minus 20 degrees C and are the ultimate solution for high-use freezer doorways. Poor productivity and high costs? 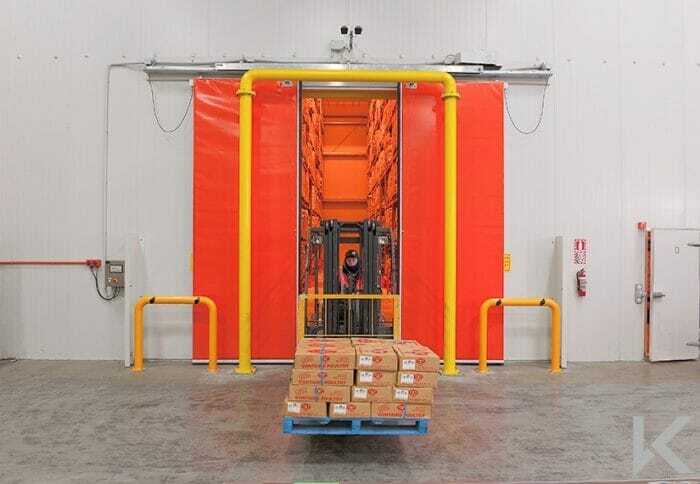 The high-speed operation ensures the doors are not open any longer than necessary, saving energy and costs by helping keep the temparature consistent within the freezer. Ulti-flex doors are a unique high-speed door because they also have a very high insulation U value of 0.23 W/M2K and a 150mm thick insulated door panel. They provide an effective barrier between the freezer and the warmer outside temperature. With the Ulti-Flex there is no need for traditional manual freezer doors combined with high-speed PVC doors which can save approximately 1 metre of precious floor space. Say goodbye to any ice problems with the Ulti-Flex system. Due to high U-Value panels, extremely efficient perimeter seals, heat trace built into the door, seals on all four edges of the door and much shorter door cycles, ice build up in doorways becomes a long distant memory. This means less maintenance costs, increased lifespan of evaporators and improved safety by providing a dry floor. 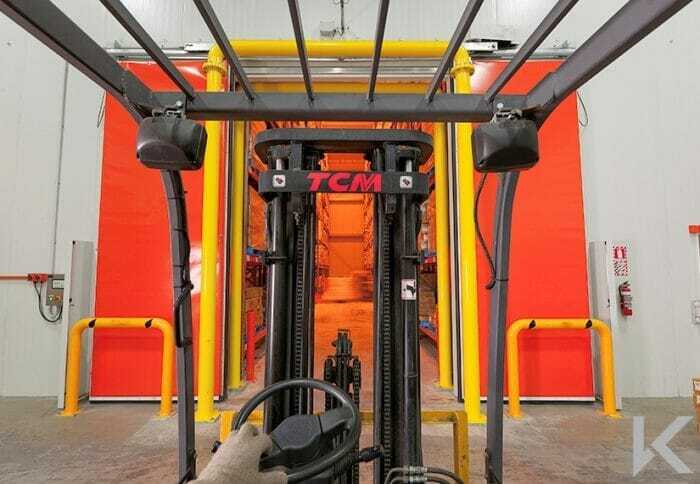 A bi-parting door is easier for the forklift operator as its saves them having to crane their neck to see whether the door has cleared the mast, unlike roll-up doors. The Ulti-Flex system allows them to see clearly when the door is open wide enough to drive through. This simple fact eliminates a high percentage of door / forklift impacts. Less downtime and save on repair and maintenance. Ulti-flex doors are designed to withstand impact that may still occur. The panels can flex and twist to absorb accidental forklift collisions yet still return to their original shape. For more serious collisions the whole door panel can release fom its floor guides and swivel on the top hanger to swing away from the impact and then automatically reposition itself in the guides. 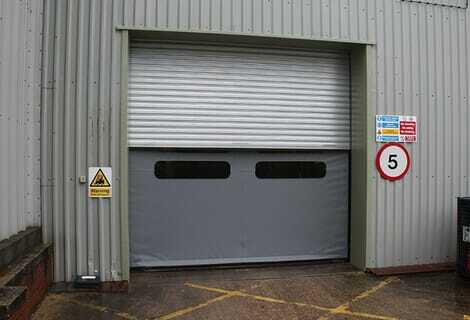 The doors have been tested in the factory and site proven with no maintenance for over 200,000 cycles! Ulti-flex doors come with full safety features such as safety edges and photocells. Other options include virtual vision systems and audio-visual warning systems. So, if saving money, reducing energy consumption and improving productivity is important to you then contact ustoday for more information or a site audit. Dupli door is just clipper's cup of tea!